Legacy in cloth: Batak textiles of Indonesia offers the first definitive study of the woven heritage of the Toba, Simalungun, and Karo Batak. The most complete analysis of Batak textiles ever published, it provides a record of more than 100 different design types, including archival and contemporary photographs showing how the textiles are woven and how they are used in Batak culture.Legacy benefits from fieldwork conducted over two decades and consultation of all major European collections of Batak textiles and private collections in Indonesia. 2009, Leiden: KITLV Press. 568 pps. 900 illustrations. ISBN 978 90 6718 351 2. Download a sample chapter PDF 4.72Mb. Copies of Legacy in cloth can be purchased directly from me. Payment, including mailing and packaging costs, can be made via . Please contact me with details of the number of books you wish to purchase and your mailing address to finalise costs. The Batak are rice farmers with a vibrant material culture. Using backstrap looms, the women have created textiles that protect not just the body, but also the soul. Over centuries, Batak weavers built up an extensive repertory that is both aesthetically pleasing and technically diverse. The textiles reveal much about the history of this extraordinary Sumatran tradition. Pre-colonial Batak life was steeped in magic and mysticism. According to Batak legend, the first weaver was a goddess from the Upper World who escaped an unfortunate marriage by sliding down her newly spun yarn to the seas of the Underworld. There she created the earth, the Middle World. Spinning and weaving practices are thus associated with the very origins of Batak life. Research also suggests that the Batak weaving arts are among the most ancient of the Indonesian archipelago. Since colonial annexation of North Sumatra at the turn of the nineteenth century, Batak weavers have successfully adapted their art to new economic and social circumstances, gradually transforming the fruits of their looms into items of commerce and fashion. In this way, they have re-invented their weaving tradition—ironically, their success threatens the survival of the ancient tradition. Changes in the weaving practices in the vicinity of Lake Toba (Sumatra) represent a considerable loss to Batak and Indonesian culture, and also to scholarship. The contents of the book dovetail the interests and results of scientific research with the goals and tasks of museums, collectors, and specialists, as well as the Batak themselves. The dream, as outlined in ‘Back to the villages’ is to have an Indonesian translation of the volume which will return to the Batak, in photograph form, their textile heritage which has been collected by Western visitors and some of which is now stored in Western museum collections. Many have expressed a strong interest in a publication that will pin down their textile tradition for posterity. If the weaving tradition ever undergoes a resurgence, it will be due to their efforts. 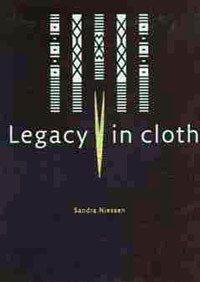 To purchase a copy of Legacy in cloth please contact me. Copyright © 2016 Sandra Niessen. The contents of this site, including all images and text, are for personal, educational, non-commercial use only and may not be reproduced in any form without the express permission of Sandra Niessen. If you experience any problems with this website please contact the web editor.